This is a really such a fun trend! Its really easy to style(even on yourself), perfect for any season, and I've had a lot of you ladies ask for a tutorial and this week is all about obliging! I have a lot of fun tutorials I plan on posting in the future, and these basics are going to be so useful, because I'll be using a lot of them in my new styles! 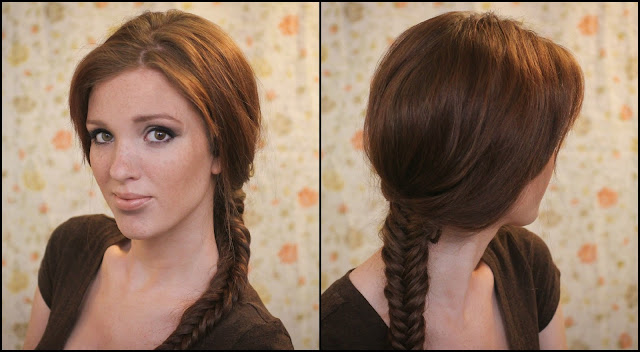 Step #1: Starting with clean, smooth, relatively product-free hair will make this fishtail a heck of a lot easier to style, trust me! 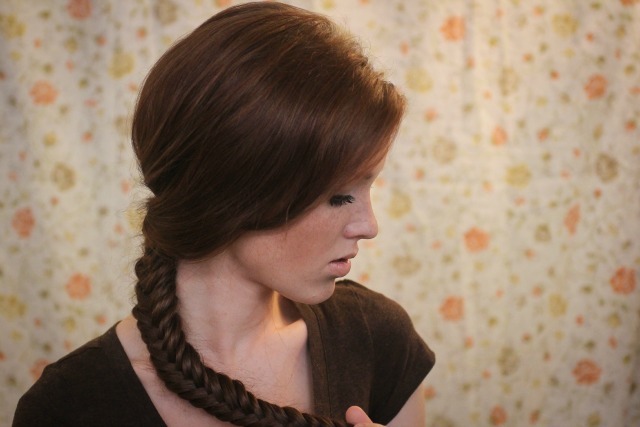 Start the braid by parting your hair into two even sections. Take a 1" piece from the outside of the left section, and pull it over to the inside of the right. Step #2: Holding your right section together tightly, remove a piece from the far right of the right section, and bring it over to the inside of the left. Making sense? In-between every couple of hair 'transfers', pull both sections tight to ensure everything is sticking together. Step #3: Take another piece from the left and move to the right, then from the right to the left, and so on, back and forth, back and forth, pulling tight, until your braid is complete! I used larger strand of hair so you could see better, but the smaller you choose to use the neater it will look (but the longer it will take so keep that in mind). Step #4: Holding onto the braid I pull tug tha hair out of the braid a bit at the back of my head, and fluff the sides a bit so its not stuck to my head so much. 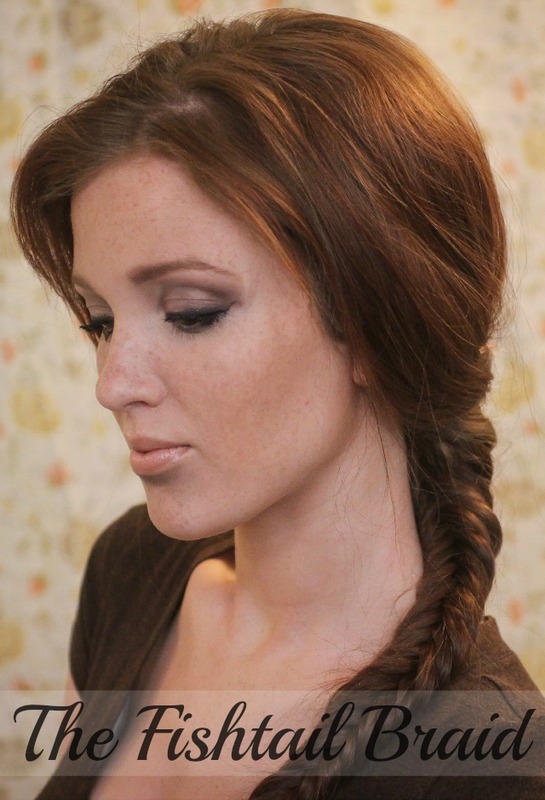 Mist your head and fishtail with some good hairspray, and you're good to go! It really goes fast when you get the hang of it, and if you're worried about getting through the first time, just remember that practice makes perfect! It may make it easier the first couple times to just start over your shoulder, or at least looking in a two-way mirror. Either way, dont be intimidated, and just have fun! As usual, I'm always open for any questions you may have, just comment below or shoot me an email and I'll get back to you! Thanks for comin' 'round, and I hope to see you back here tomorrow! I don't think that I am ever going to be skilled enough to do it, but it looks amazing! Fishtail braids are hard to do. You did a great job demonstrating it, writing the steps and documenting in pictures. I tried it just once. But quickly pulled it apart because it turned out too loose. I'll have to attempt this braid again. I love to make fishtail braid to the others, not to me because my arms get tired :P Now that my hair is short I can't do it. Thank you fotr this nice tuto! 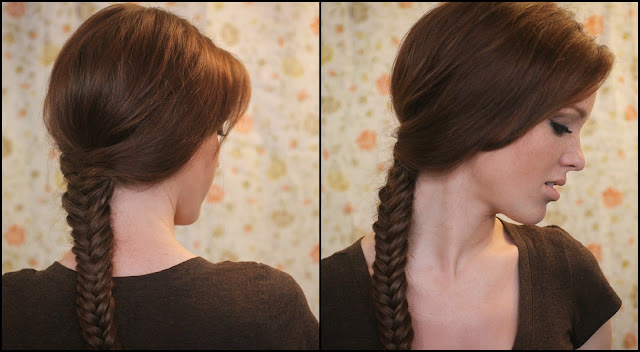 Your fishtail is AMAZING!!! I love putting my hair in a fishtail and then throw a big floral headband on!! !